Oregon nursery operators play an important, but frequently overlooked, role in protecting pollinator health. They produce pollinator attractive plants that are destined to be planted in urban areas across the United States. These plants provide bees with pollen and nectar resources and contribute to the success of roughly 500 species in Oregon and 4,000 species nationwide. What would it take for people to take notice of the work that Oregon growers are already doing? What is the best way to capitalize on the interest in creating bee habitats? For a long time, perhaps centuries, flowering plants have been marketed primarily for their aesthetic qualities, such as flower size, color and plant structure. It’s only recently that consumers began to value plants that carry additional environmental benefits, such as drought tolerance or drought resistance, habitat for wild birds and insects, sustainable food production and others. And what’s more, growers are already selling plants into this market. So why isn’t Oregon nursery production for pollinators a bigger thing? 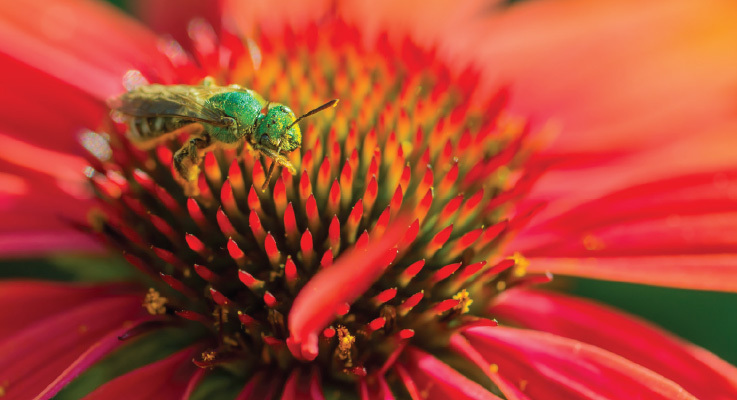 These findings all point in one direction, namely the need for a strategy that combines labeling and marketing around pollinator-friendly plants and growing practices, with a mechanism to confirm the benefits to pollinators from university extension and research. 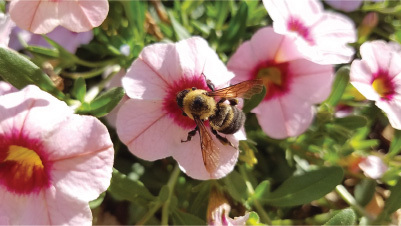 The Oregon Bee Project provides an excellent way to connect the dots between consumers, the nursery industry, university research and extension and the bees. Initiated in 2017, the project is a cooperative effort between the Oregon Department of Agriculture (ODA), the Oregon State University (OSU) Extension Service, the Oregon Department of Forestry (ODF), and a diverse set of stakeholders who are actively engaged in caring for our bees. Together these collaborators and supporters are launching several initiatives to maintain and enhance bee health in Oregon, including showcasing industries that are making a difference for pollinators. Over the next three years, the Oregon Bee Project will be working with the Oregon Association of Nurseries (OAN) to help promote the plants grown here in Oregon that help bees. A first step is to do something Oregon Bee Project has already done with the Specialty Seed Growers of Western Oregon (SSGWO): namely, to develop an industry standard, or Bee Protection Protocol, around pollinator health. Excellent standards have already been developed by the Horticulture Research Institute (see HRI) and can be used as a starting point. In parallel, we are looking to document the adoption of both nursery Bee Protection Protocols through grower surveys. Farms implementing these protocols will be showcased as Oregon Bee Project Innovators using a digital media campaign, primarily using Oregon Bee Project owned media channels (Facebook, Twitter and OSU PolliNation podcast). The final step would be to integrate the Bee Protection Protocols into a strategy to label Oregon s nursery plants as Oregon Bee Project Pollinator-Friendly Plant Picks. This would entail determining the best plants for pollinators that are commonly grown in Oregon from the following categories: annuals, perenials, shrubs and trees. Plant selection would be based on a literature review and Western Oregon plant selection field trials directed by Dr. Gail Langellotto’s Garden Ecology Lab. The extent of production of these plants will be determined by Langellotto working in conjunction with Dr. Lloyd Nackley with OSU Nursery Research and Extension, so that a marketing initiative leverages what is already being grown in the state. We are also looking to gauging the interest of a labelling program by working with local nurseries, Master Gardener volunteers and by tracking targetted social media promotion using Oregon Bee Project media channels. Growing nursery plants for bees is something that has matured over the past few years. Oregon Bee Project can provide a unique opportunity to work with Oregon nurseries to put our success on dislay, to be prominent as the market for pollinator plants matures, and to fill urban landscapes with the plants bees are eager to visit. 1. Breeze, T.D., Bailey, A.P., Potts, S.G. and Balcombe, K.G. 2015. A stated preference valuation of the non-market benefits of pollination services in the UK. Ecological Economics 111: 76–85. 3. Diffendorfer, J.E., Loomis, J.B., Ries, L., Oberhauser, K., Lopez-Hoffman, L., Semmens, D., Semmens, B., Butterfield, B., Bagstad, K., Goldstein, J., Wiederholt, R., Mattsson, B. and Thogmartin, W.E. 2014. National valuation of monarch butterflies indicates an untapped potential for incentive-based conservation. Conservation Letters 7(3): 253–262. 5. Khachatryan, H., Rihn, A., Campbell, B., Yue, C., Hall, C. and Behe, B. 2017. Visual attention to eco-labels predicts consumer preferences for pollinator friendly plants. Sustainability 9(10), p. 1743.